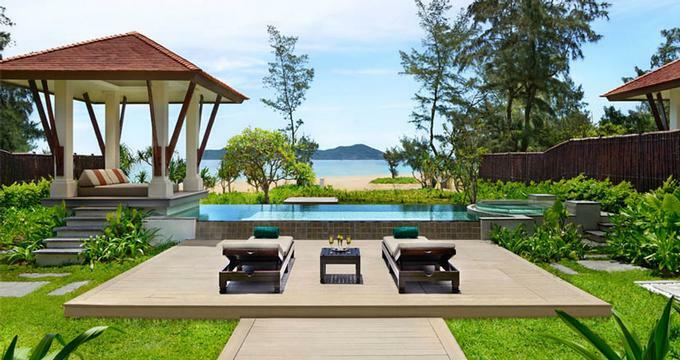 Banyan Tree Lang Co resort is situated on a serene beachfront in central Vietnam with stunning views of the ocean and the Annamite mountain range. The resort is conveniently located within thirty miles (forty-four kilometers) of Phu Bai International Airport and within forty miles (sixty kilometers) of Da Nang International Airport. Accommodations comprise individual villas, each with their own private pool. Nestled in a lush landscape, the resort is within easy reach of three UNESCO World Heritage Sites, including the dramatic temple ruins of My Son. There are many activities to partake in, from golf and cycling to boating and Yoga, making this resort ideal for couples and families. Guests can choose from six different types of villa with capacity ranging from one to three bedrooms. 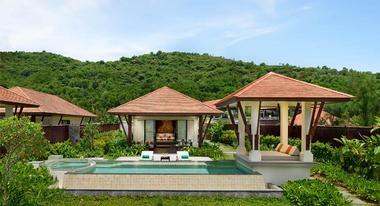 The resort has a total of forty-nine villas. All accommodations include private detached villa, generously-sized private swimming pool with adjacent deck and sun loungers, private gardens, in-villa safe and complementary non-alcoholic mini-bar that is restocked daily. Every villa has complete privacy due to the attractive bamboo fences that border each property. All accommodations include a turndown service. The Lagoon Pool Villa features one bedroom with king-sized bed and a spacious separate bathroom. The villa faces a lagoon and is surrounded by its own gardens of lawn and plant borders. Amenities include wireless Internet, LCD TV, on-demand movies and music, bathrobes, hairdryer and tea and coffee-making facilities. Outside there is a large covered and furnished terrace, a swimming pool and timber sundeck with sunshade and loungers. The Sanctuary Pool Villa has the same features as the Lagoon Pool Villa but also includes unlimited spa treatments at the on-site Banyan Tree Spa. As such, the accommodation comprises lagoon views, one king bedroom, separate bathroom, gardens, covered furnished terrace, pool and sundeck. The villa has Wi-Fi, LCD television, movies and music on demand, dressing gowns, hairdryer and facilities for making tea and coffee. Situated right next to the sandy beach, the Beach Pool Villa is equipped with one bedroom with king-sized bed and a separate bathroom. Featuring all the amenities of the Lagoon Pool and Sanctuary Pool Villas, the outside space also includes a poolside sala pavilion with plush mattress for the ultimate in beachfront relaxation. For those seeking more spacious accommodation, the One Bedroom Seaview Hill Pool Villa provides a real home from home. In addition to the king bedroom and separate bathroom there is a spacious open living and dining area with adjacent kitchenette and washroom. The fully air-conditioned villa includes an audio system and IDD telephone as well as all the standard features such as LCD TV and wireless Internet. Perched on the hillside, the villa offers outstanding panoramic views across the ocean which can be enjoyed from indoors, or from the pool and outdoor lounge. Perfect for families or small groups, the Two Bedroom Seaview Hill Pool Villa offers generous air-conditioned living accommodation and splendid ocean views from its hillside location. The bedrooms, each with their own large separate bathroom, are situated at either end of the villa. Central to the accommodation are the living room, dining room, kitchenette and washroom. Outside, there are two decks to either side of the infinity swimming pool, which are accessible from each bedroom as well as the main living area. The Three Bedroom Seaview Hill Pool Villa is ideal for families and groups of friends. The air-conditioned accommodation is nestled into the lush hillside and comprises two king bedrooms and one twin bedroom, each with their own private bathroom. The spacious living area includes sitting room, dining room, gourmet kitchen and washroom. The villa features beautiful works of art and furnishings crafted by skilled local artisans. Outside there is a timber deck to either side of the infinity swimming pool, a jet pool and breathtaking ocean views. The beachfront Azura restaurant serves seafood, pizza and traditional Italian cuisine, with pizza prepared at an open counter so guests can watch the expert chefs at work. Azura has indoor seating and a veranda for al fresco dining. Furnished in cool white and chocolate-brown, Azura is perfect for casual dining. Saffron is the signature restaurant of Banyan Tree Lang Co, and this elegant fine-dining restaurant offers stunning views from its floor-to-ceiling windows. Furnished with touches of rich purple fabrics, guests can indulge in a menu of traditional Thai cuisine. The Water Court is a contemporary restaurant serving Vietnamese and international dishes. Diners can watch the chefs at work in the show kitchen from the indoor seating, or venture outside for an al fresco experience. Decorated in cream, wood shades and scarlet, Thu Quan is an attractive and comfortable venue for enjoying snacks, teas or cocktails. Thu Quan is the resort’s lounge bar, and it is elegantly furnished with comfortable cushioned sofas, chairs and barstools. Thu Quan serves a variety of beverages such as cocktails and tea, and there is an all-day snack menu. In-villa dining is available and is called Destination Dining. Guests can also choose to dine on the beach or in another romantic corner of the resort. All Destination Dining includes professional service and utilizes an extensive In-Villa Dining Menu. For guests wishing to venture outside Banyan Tree Lang Co for dinner, the resort recommends the nearby Vi?t Long Restaurant, situated on floating docks, and Bé Thân Restaurant, located in Lang Co Town. Both venues have extensive selections of fresh seafood specialties. The on-site Banyan Tree Spa has a full range of massages, therapies and treatments including the soothing Foot Bath and the Royal Banyan Herbal Pouch Massage. Remedies are performed by expert therapists using fresh local ingredients such as exotic pandanus and butterfly peas. Three spa packages are available so guests can indulge in a variety of complementary treatments. These comprise the Royal Banyan, which combines the Herbal Pouch Massage with Jade Face Therapy, the Banyan Calm, which includes a Swedish massage, and the Refreshing Sprinkle, which provides a body scrub followed by the invigorating Rain Shower. Banyan Tree Spa was awarded Best Luxury Emerging Spa in the 2014 World Luxury Spa Awards. Banyan Tree Lang Co has four meeting venues and can accommodate up to twenty-four delegates. Ideal for small conferences, the resort is also suitable for team bonding sessions due to the wide variety of nearby attractions and activities. The facilities are also suitable for reunions and family gatherings. The Laguna Lang Co Golf Club is situated within close proximity of the Banyan Tree Lang Co villas and was designed by Sir Nick Faldo. The par-seventy-one course is surrounded by scenic mountains with waterfalls and the sea breezes provide a perfect accompaniment to the heat of the sun. This stunning course is the perfect challenge for golfers of medium to low handicap and players can unwind afterwards with excellent food and ice-cold beers in the club’s restaurant. There is plenty to do at the resort, such as golfing, private Yoga sessions, spa treatments and delightful dining options. Additionally, the Laguna Sea Sports Centre and Marine Lab is located on the resort’s beach and offers a full range of water sports including snorkeling and parasailing. However, there is also much to see and do in the surrounding area. Guests who enjoy active vacations can explore the Hai Van Pass on bicycle. This ancient highway winds its way across the mountains between Lang Co and Da Nang and provides spectacular views of the surrounding countryside and the sea. For a more laid-back excursion, hire a traditional basket boat in Lang Co and explore the tranquil lagoons and mangroves at leisure. Three UNESCO World Heritage Sites are close by, and these provide a fascinating cultural insight into Vietnam’s rich history. Discover the ruins of the Hindu temple at My Son, the former port city of Hoi An with its well-preserved Ancient Town and the walled fortress and palace at the Imperial City, Hue. Nature lovers can take a tour of Bach Ma National Park. Located just under an hour-and-a-half from the resort, the park is well worth the drive as it is home to more than two thousand species of bird, mammal, plant and insect, as well as fifty species of fish, reptile and amphibian. The park extends over an area of eighty-five square miles and reaches an elevation of almost five thousand feet at the peak of Bach Ma Mountain. There are lots of activities for couples in the local vicinity, and one of the most popular is a couples’ cooking class. Participants can learn how to make their favorite Vietnamese dishes so they can recreate them once back at home. Students could learn how to cook perfectly crispy spring rolls or the regional noodle dish of Bun Bo Hue, all while spending quality time with their partner.